Kubenetes is increasingly popular open source platform for managing resources and applications. Originally developed for stateless services orchestration, eventually it opened doors to stateful ones, including databases. Many companies are moving their infrastructure inside Kubernetes, because it is simpler to manage. One of the most important things about Kubernetes is portability. Kubernetes clusters can be installed on bare metal servers, public cloud providers like Amazon, Azure and Google Cloud, and in private clouds. Thus applications developed for Kubernetes can run virtually everywhere. Indeed, Kubernetes is sometimes called the new Linux. So once we have ClickHouse running inside the Kubernetes, it opens up a way to many environments. An operator in Kubernetes is a somewhat new concept. In a nutshell it is a Kubernetes extension that simplifies configuration, management, monitoring and more, for certain application types. Human operators operate real life systems, knowing the domain very well, knowing how to handle standard maintenance tasks and reacting properly to incidents. Operators in Kubernetes do pretty much the same: they operate applications in an efficient and application-specific way. Our friends from the Kubernetes consulting company Flant like saying that Kubernetes operators are codified operational knowledge. 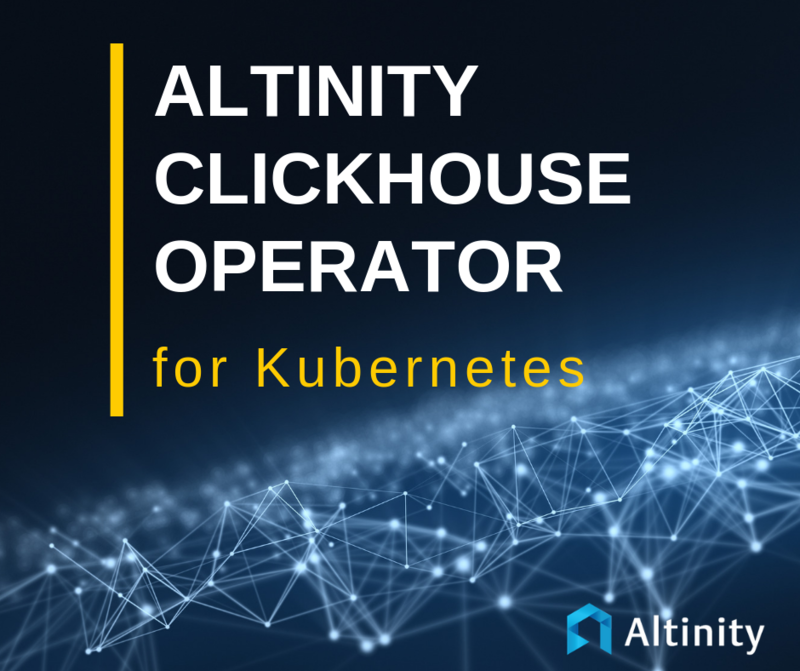 Altinity ClickHouse operator does all of the above, and much more for ClickHouse in Kubernetes. A single ClickHouse server is very easy to install. But if you ever tried creating a ClickHouse cluster you know that this part is not so obvious. Our tutorial may help you understand the concepts, but there is still quite a lot of manual work required. With the ClickHouse operator there is not much of a difference if you are setting up a single node or a cluster. What it means is that you can start ClickHouse cluster of any size in seconds! A good example is worth a thousand words, so let’s go. We assume that you are familiar with Kubernetes already. If it is not the case, please refer to https://kubernetes.io for a quick Kubernetes introduction. The examples below were run using local minikube installation at my laptop, but there is no difference in real production Kubernetes environments. Proper storage provisioning and networking in Kubernetes have some specifics that are out of the scope in this article. ClickHouse operator needs to be installed to your Kubernetes system first; this is a very simple step, but we will skip it for now. Instead, we will jump into an example right away. Connected to ClickHouse server version 19.1.14 revision 54413. 0 rows in set. Elapsed: 0.016 sec. 3 rows in set. Elapsed: 0.054 sec. configuration that defines how ClickHouse hosts comprise the cluster. That allowed us to create distributed tables. In this case Kubernetes sent a message to our operator about the changes. The operator understood that there is a change in the object specification and that the change requires an extra shard to be added. The operator provisioned a new pod, configured an extra shard, and updated the configuration of previously created shards, so they are all aware of each other. With a few keystrokes we have scaled up ClickHouse cluster! We are going to discuss ClickHouse operator features and configuration details in the next few articles. For those who cannot stand the suspense, you are welcome to try it on your own. Documentation and examples should help you to start using the operator quickly. Also do not miss the “ClickHouse on Kubernetes!” webinar on April 16th. Altinity CEO Robert Hodges will be there with you to demonstrate how to set up ClickHouse on Kubernetes with Altinity ClickHouse operator, and can answer questions. Stay tuned! Many ClickHouse features like LowCardinality data type seem mysterious to new users. ClickHouse often deviates from standard SQL and many data types and operations do not even exist in other data warehouses. The key to understanding is that the ClickHouse engineering team values speed more than almost any other property. Mysterious SQL expressions often turn out to be 'secret weapons' to achieve unmatched speed. In fact, the LowCardinality data type is an example of just such a feature. It has been available since Q4 2018 and was marked as production ready in Feb 2019, but still is not documented, magically appearing in some documentation examples. In this article we will fill the gap by explaining how LowCardinality works, and when it should be used. This post in two parts provides an overview of ClickHouse network configuration with lots of examples. In the first post we describe the overall connectivity design and configuration of listeners and ports. In the second post we describe how to enable encryption, solutions to common problems, and further reading.